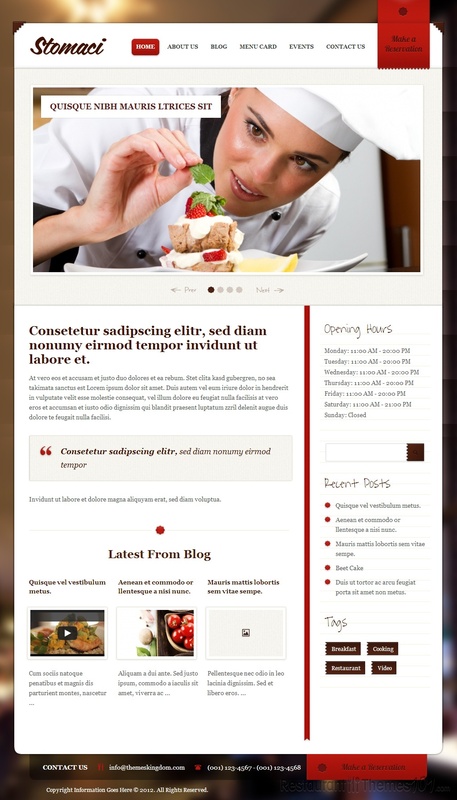 Stomaci is a restaurant theme for WordPress developed by Themes Kingdom. This theme has a great layout with a unique modern and rustically looking design that was created to catch and keep the attention of your visitors. The combination of styles and colors makes it possible for this theme to fit a nice, welcoming old style restaurant as well as modern, exclusive places. Either way, your visitors will be impressed. 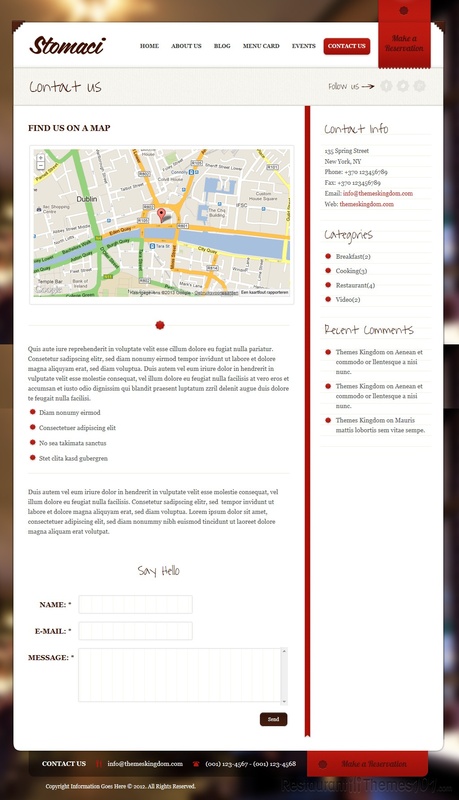 Aside from looking attractive, this theme has many special features that are more than useful for restaurant websites. The menu card featured in this theme is very easy to create and it looks absolutely great. 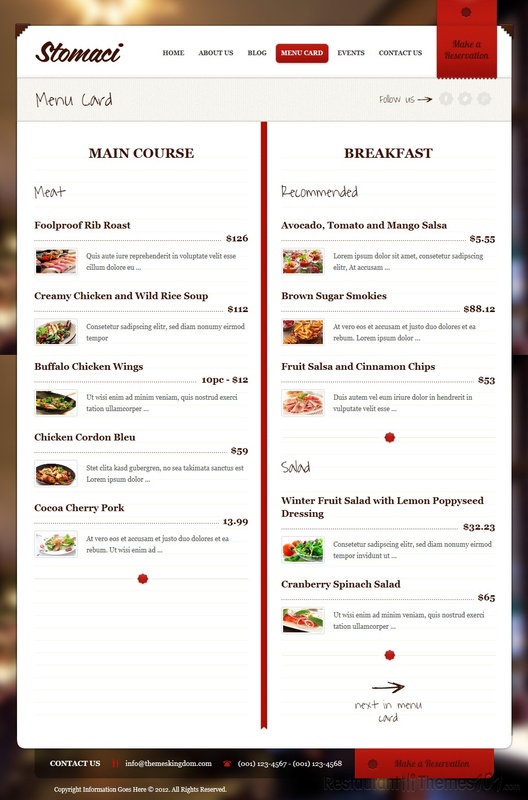 You will be able to create your own menu cards with detailed descriptions of your meals along with photos. The reservations system offered will allow your visitors to book a table by just clicking several times and save them a lot of time and effort. 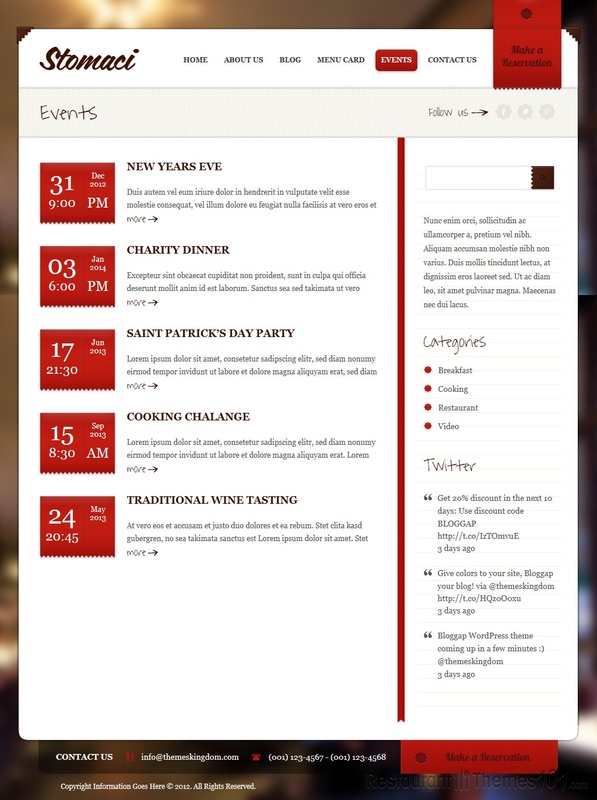 You will also be able to create events, and be as specific about them as you want to, by adding descriptions and details. The admin panel is very easy to operate and it is white labeled which is great for designers who customize the themes for their clients. Stomaci has several color skins you can choose from and fit the theme to your needs with just few clicks of your mouse. For all your visitors who are out of town, or simply not sure where your restaurant is, there is the Google Maps integration that will show them the exact location of your place. The theme is translation ready and it can be translated in any language with .po files included. It also has SendLoop integration and MailChimp integration. It is widget ready and it contains several custom widgets, such as Advertising, Twitter stream, Recent posts, etc. This theme has a great shortcode generator included, as well as PSD files and page templates. It comes with extensive documentation and multiple support resources.